Play the best free to play Online Footballmanager ever! Come to fame with your own club, win the championship and become a notorious manager! Play championships in major football superpower countries and meet the top of the world in the GSSL Superleague! Tournaments, friendlies and challenges for daily fun! Football clans, community actions, buddies and much more! GOALstar is different. Interact in fights against managers from all over the world with realtime decissions that take effect in a split of a second to archive victory! Invite friends and get a reward! You want to surf the internet and keep a lid on the livematch of your club at the same time? No problem! Take advantage of the GFA Notifier! One click login into the managergame! The GFA Notifier only works with Mozilla Firefox! The Add-on bar must be activated. For more information visit the Game Forum or just take a look at the game manual. 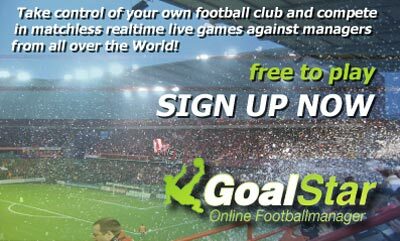 GOALstar Online Football Manager Game is the first choice for Stragetic Football Elite Gamers. No download or installation needed. A Massive Multiplayer Online Game (MMORPG) brought to you by vibytes.